Being part of the Concreteweb-team is both a blessing and a curse. At the one hand, I have the opportunity to listen to tens of excellent recordings each week (imagine, I’m still working fulltime too, and have a family to take care of), but sometimes our chief editor f*cks me by giving me stuff that is way beneath my intelligence. Brings me to this album, done by a label I always am careful with. Buil2Kill released some stuff I could appreciate a little, but most of their roster is not really my cup of poisonous tea. And with this release the poison makes me puke. I’ll explain you why. 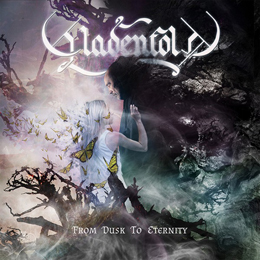 Gladenfold, formed about a decade ago, are a Finnish combo that plays Extreme Metal for wimps and pussies. That’s it. No, seriously, From Dusk To Eternity contains everything that could please an audience celebrating their first pubic hair. The album combines elements from orchestral Death and Black Metal (the Cradle Of Filth-way), modern Power / Epic Metal, and Pop-Rock-Metal à la Finland. Showing you can handle your instrument, that’s all right, but doing this through songs that are based on infantile clichés, lacking of (haired) balls, and stupidly playing with fake / faked emotions, no, that’s not polite at all. Shame on you, naught babies… And taking elements from your ‘heroes’ in order to translate them in a mostly pathetic way, what the frikadellekes?? ?